Established in 1988, New York Ballroom is the Gold Coast's largest and longest running dance studio. New York Ballroom is centrally located and operates 7 days per week. Offering a choice of 4 dance styles including Modern Ballroom, Latin and American, Street Latin, and New Vogue dance styles. Whether you are interested in dancing as a serious hobby or need to prepare for an upcoming social event, our fully qualified professional instructors can offer their tuition in private or group classes. 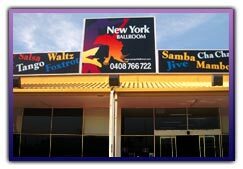 New York Ballroom offers first class facilities including a large spacious mirrored air-conditioned dance floors, changing rooms, specialised lighting, and offer the latest dance music available. The team at New York Ballroom believe when you enter the studio for a private lesson or our carefully planned group classes, practice sessions, or party nights, you will enjoy our quality instruction, positive friendly and atmosphere and the personal growth that comes from dancing. Dancesport competitor, social dancer, fitness fanatic, advanced or beginner dancer - come and be part of our growing and exciting school. Diane began dancing at the age of seven and quickly climbed the ladder of dancesport in QLD with Juvenile, Junior, and Adult QLD Championships. In 1980 she became the Australian Open Professional Champion in both Latin and American And Ballroom winning many other Australian Championships along the way including South Pacific and National Southern Cross Championships. She has represented QLD numerous times in the past and was Australia's representative to the Worlds Latin Championships at London's Royal Albery Hall. After 3 successful trips to London and Europe, Diane turned Professional to concentrate on teaching and adjudicating. She has been on the Australian Latin Adjudicating panel now for over 10 years and features on every major panel in this country.